Six security personnel were killed by terrorist gunfire at Wadi Kaam checkpoint this morning (Photo: 218News). 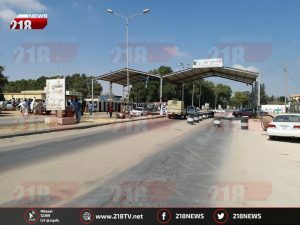 At least 6 Libyan security personnel and one ‘‘terrorist’’ were killed early this morning at the Wadi Kaam checkpoint 65 km east of Tripoli and 15 km east of Zliten on the Khoms-Tripoli main motorway. The attack has been labelled a terror attack and attributed to ISIS by the Tripoli-based Libyan government. There are two security personnel said to have serious injuries and up to 10 others with non-fatal injuries. The terror attack was carried out by at least 3 perpetrators who opened gunfire using light guns and machine guns on the checkpoint. One of the assailants was shot dead whilst the others fled. Their vehicle was recovered. The area is being combed by local security forces. The Ministry of Interior, aligned to the Faiez Serraj Presidency Council condemned the attack and called for unity for the sake of safety, security and stability.